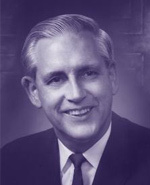 (1967-1977) Dr. Williams' presidency was one of buoyant optimism during which Western continued to grow and diversify. The range and depth of its intellectual pursuits, the richness of its cultural life and athletic activity, and the variety of social life on its campus all became more sophisticated as Western matured into a major university. After completing undergraduate studies in his home province of Manitoba and pursuing graduate studies in psychology at the University of Toronto in 1940, Williams served as an officer in the RCAF during the Second World War. Following the war, he returned to Toronto where he became vice-president of two new colleges at Erindale and Scarborough before being recruited as Western's fifth president. When he arrived, Western was in a state of transition in two areas of its corporate life: the dissolution of the college system within the Faculty of Arts and Science, and the transformation of its governing structures. The attempt to impose a college system at Western by his predecessors, Williams believed, ran counter to the constituent university's tradition as a single entity. Known for his charm and deep sense of duty, Williams changed the managerial tone at Western, overseeing sweeping changes in the academic structure as the University moved away from the college system to a faculty system.